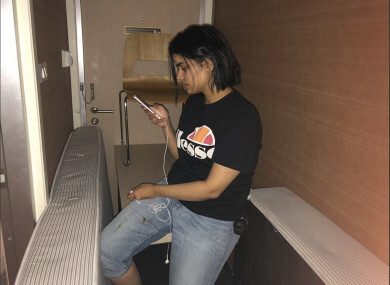 Photo released by Rahaf Mohammed Alqunun/Human Rights Watch, Rahaf Mohammed Alqunan views her mobile phone as she sits barricaded in a hotel room at an international airport in Bangkok, Thailand. THE SAUDI WOMAN who made a desperate plea for asylum after landing at Bangkok airport has been placed “under the care” of the United Nations refugee agency. The 18-year-old said she had planned to seek asylum in Australia and feared she would be killed if repatriated by Thai immigration officials who stopped her during transit yesterday. Thai immigration chief Surachate Hakparn had said that Qunun was denied entry because of her lack of documents. After announcing that Thailand “will not force her” to leave, Surachate told reporters today that Qunun would be “allowed to stay” after a meeting with officials from the UN refugee agency UNHCR. “She is under the care of the UNHCR now but we also sent Thai security to help take care (of her),” Surachate told reporters at Suvarnabhumi airport. He said Qunun had told UNHCR officials she “wants to stay in Thailand for a while while seeking asylum to a third country”. The agency “will take five days to consider her status” and another five days to arrange for travel, Surachate said, adding that he would meet with Saudi diplomats tomorrow to explain Thailand’s decision. Following the announcement, a relieved Qunun tweeted that she felt safe “under UNHCR protection with the agreement of Thailand authorities”, adding that her passport had been returned to her after being taken away. UNHCR’s spokesman in Geneva Babar Baloch confirmed Qunun had “left the airport to a safe place in the city” and said agency officials would interview her once she had had some rest. Email “Saudi woman 'under the care' of UN agency”. Feedback on “Saudi woman 'under the care' of UN agency”.